I started with an excellent VB AI example project by Takis Firipidis. It is a simple AI logic gate, with two inputs and three neurons, but it contains a perfect example of how to execute an activation function in VB. After several day’s of reverse engineering, I converted his VB code to VBA, replaced his references to memory variables with ADO calls to Access data sources, and I built a database schema with three tables of Networks, Neurons and Synapses to store the nets. The system can store many Neural Networks in these three tables at once, and can even share neurons between Networks creating multi-tiered and clustered multi-network solutions. Furthermore, given that Access (or SQL) cans store millions of rows of data, the system could theoretically handle networks of massive size (although currently training is way too slow for that and the Network Diagram it draws starts to become illegible with more than 100 neurons in a layer). 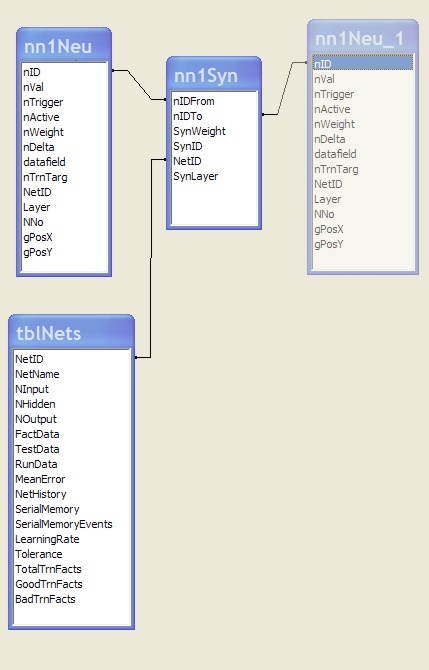 The main table of the system is the Table of Networks, (tblNets) each record contains network architecture, names of data sources, and training history. The Table of Neurons (nn1Neu) and the Table of Synapses (nn1Syn) are linked to tblNets by Network ID (NetID) and to each other by Neural ID (nID). Two main SQL queries (qryCurrNN and qryCurrNNSynLayer) identify the current NN and activate the top and bottom halves of the MLP in sequence. The original idea was to create a pure SQL solution. There were two SQL queries for forward activation of the MLP and four more for back propagation. This was way to slow. By version 2.0, I had replaced most of that with ADO calls in a series of VBA subs. Its much faster, but I still use two queries for backprop. The simplest way to implement NN.MDB is simply to link tables between your MSA app and NN.MDB then open NN.MDB run it on the linked table, then go back to your app and view the results. All in all, I was amazed at how little code it really is. The single module, basNN1, prints out on five pages and contains all the code need to create the NN, train it, test it, and run it. And even then some of its a little redundant.